Kiva has just expanded to provide microloans in the United States now. We're excited to make our first loan to a borrower in the US! Our first loan is to Jeremy, an entrepreneur looking to expand his BBQ business. Mmmmmm, BBQ! They specialize in a delicious looking tri-tip and anybody that grew up near Santa Maria, CA has to love that. 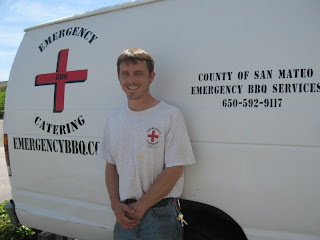 Good luck Jeremy and Emergency BBQ! "Jeremy is a former ambulance driver and a high-energy entrepreneur. He runs Emergency BBQ, a mobile catering company that serves up barbecue favorites in a style Jeremy calls California Beer B-Que. Jeremy is ready to take his business to the next level. With this loan, Jeremy will expand his business beyond on-the-go catering trucks and open up a retail store in San Carlos. He will be able to cater a greater number of lunch and dinner events from his shop, as well as serve lunch to local workers in San Mateo. He will also be able to create full-time employment for his three seasonal employees. Watch a video of Jeremy at: http://www.youtube.com/watch?v=T6g4dz3r_yo&feature=channel_page"